What we were making for the first few weeks of school. This Dream Scene project is a stalwart for me, as it fuses student engagement with technology, writing about aspirations and sparks lots of discussions about where they see themselves in the future. The arrows should move you along through this Flickr album. Nothing brings “context” more into focus than sitting down and reading (or maybe standing up and reading .. that works, too … don’t drive and read, though .. that’s just dangerous) a set of cartoons from the 1920s. While some of the cartoons might have resonance over time, finding that universal funny bone gag that stands above the time in which it is written, most will have you scratching your head, wondering about what was going on in the world that made this particular sketch and caption funny. Or am I putting my confusion on you? That was what came to my mind, anyway, as I was reading The New Yorker’s 90th Anniversary Book of Cartoons last night (with some funny subtitles, such as “Sequentially Paginated for Easy Access” and “A Special Section of Radio-Friendly Cartoons” as the editors play up and make fun of the book format in a digital age). I was on a bench, at a sports field, as my son played ball, laughing and giggling, with some adults nearby, glancing over at me. A few kids wandered by, curious. 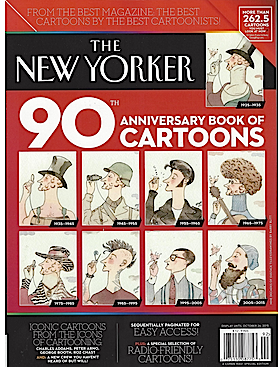 The book is really a magazine and not a book, anyway, and it covers a lot of ground — moving through each decade of cartooning from the 1920s to the present in the esteemed magazine, with a funny introduction by New Yorker Cartoon Editor Robert Mankoff. I like that phrase of “reflected and refracted” as a reason why cartoons work as commentary, and also, his phrasing explains why some cartoons don’t necessarily resonate outside of their times. Sometimes, it takes a collection like this to remind us of how things have changed, even if it often feels as if the world remains static. Of course, there are always those cartoons, too, that just don’t work for a certain reader, no matter what. I blame the cartoonist. 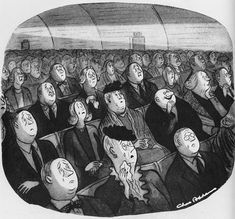 Even so, I enjoyed the art and the writing, and the wit of play, in this New Yorker collection of cartoons, and decided (as a research reader of one) that Charles Adams’ cartoons hold up the best over time, hands down. For all my writing and teaching and wondering about the ways in which the digital world is changing the way we write and compose, there are still many moments when the digital can’t hold a candle to the non-digital. This week, I got a reminder of that. In the mail. Snailmail. Brian Selznick’s new book, The Wonders, arrived in a box and wonder is right. I haven’t even read the book yet (it’s next on my pile, though) but already, I am entranced by it in ways that no Kindle or ebook format could ever do. It’s the tangible qualities of The Wonders that has me eager to dive in. My eyes pick up its presence every time I walk by the counter where I have it sitting. It’s begging to be read. Like his two other books that I loved — The Invention of Hugo Cabret and Wonderstruck — The Marvels is clearly a work of art as much as a work of storytelling, with Selznick’s distinct drawing style moving one story along while the text moves a second story along, and I suspect they will converge together. But it is the physical book itself that has me fascinated right now. From the cover itself, with its golden fonts, to the page bindings that are dipped into some golden gloss that reflects movement in the room, to the feel of the book (it’s heavy, as if indicating some story worth its weight in gold), and the way you can flip through the book and feel as if if you are submerging into the story. You physically hold The Marvels and there is no doubt that you are holding a book! You might need a literary sherpa to help carry it, but dang it, it’s a book you’ve got, not an app or a file. And there is something wonderfully powerful about this realization that a physical book itself, one you hold in your hands — paper and words and ink — can still stir that kind of excitement in a reader. Yes, the ability to embed media, and add links to other content, and bookmark with notes, and all of the other whizbang options of digital books is fascinating and interesting. But …. I still yearn for this kind of experience, too, and it feels like a dying ember of publishing — exciting readers with the design of a book. This publisher figured it out, and I (at least) am willing to pay a bit more to own a book that is art in and of itself. Now, I can’t wait to dive into the story and immerse myself into the entire experience. One of the best things about being a leader with the Western Massachusetts Writing Project (beside learning about writing and the teaching of writing) is connecting with colleagues in other schools and other levels of teaching. Yesterday, our WMWP board met for the first time this school year, and we began discussion of “themes” to guide our activity, work and conferences this coming year. We didn’t agree on an overarching theme yet, but you can see from this brainstorming list that we have a lot of possibilities to chew on and we will try to make connections across ideas. This list captures only the main ones that emerged from an enriching writing and sharing activity during our meeting. But the ideas here cover a lot of ground worth exploring. I enjoy Wired Magazine, most of the time, and every now and then, they come out with a special issue that really gets my attention. The latest (Sept. 2015) is an interesting take on how people learn, with Dr. Dre and Jimmy Iovine on the cover. The magazine then moves into its “Cultural Literacy” section, with focus on Culture, Design, Business, Science and Security, with the lens on people making a difference in the world and ways that people can get engaged in learning on their own terms in these various emerging fields and subfields. It reminds me, yet again, of how I am teaching to my sixth graders literacy practices that have to be applicable to a world that may not yet exist. As I read through the magazine, it seems as if many of the topics were barely if even on the radar screen five or ten years ago. Flexibility around writing, reading, creating media is a key element, and finding that ground is a challenge for any teacher. Nothing happened yesterday. Nothing of note. I am sitting here, early morning with a cup of coffee, mulling over what I might write about for my Slice of Life. There’s always something. But, I can’t find a little nugget to grasp and build a single story around. I wrote a blog post in the morning. No one commented. We did character sketches — short pieces of writing about a character that goes beyond name and description, focusing in on motivation and the strengths/flaws that enrich a character in a story. We used my oddly weird Storyteller Cards for this. The kids loved the cards. It was Picture Day. The weather cooperated, so we were able to do it outside. It disrupted the day’s schedule but we rolled with it. I kept moving forward with Benchmark Reading Assessments in every free moment of the day, and the prospect of weeks of testing this way has me tired every time I think of it. A union meeting after school about stalled contract talks made me weary. I know contract talks are always negotiations, but it seems like we are pretty far apart right now. I was met at home by my son, who asked if I had remembered to bring home the last book in the Maze Runner series. I had. Also, the prequel. He dashed to the car, and came in, book open, already reading the first pages. Restaurant Week is this week in our small city, known for its arts and restaurants. My wife and I slipped out and away from the kids to enjoy a nice meal together at an upscale restaurant we normally could not afford. It was yummy. Confirmed meeting with the owner of a music practice space. Our band is reforming and on the roam for new space to practice in. It’s stressful to be a homeless band. Read Aloud to my son and then reading quietly to myself, and then … sleep. 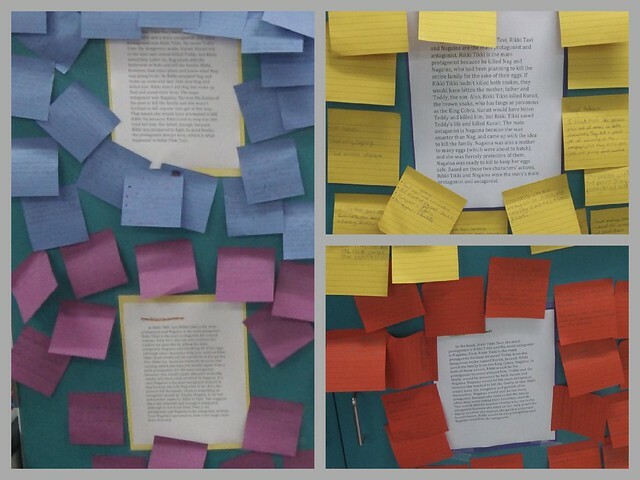 I’ve written about this project before at Middleweb, and yet, every year that I put this Six Word Memoir out to sixth graders as an extension activity, I am always amazed at what they create. 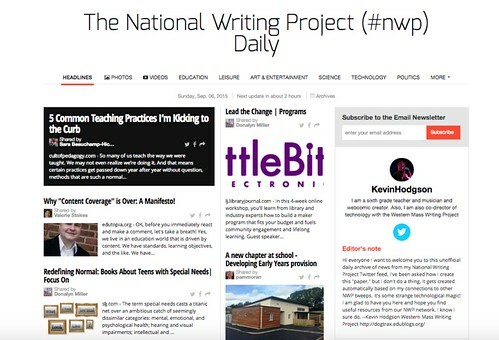 It’s been some time since I shared out my curated NWP Daily News via Paper.li, and I use that word “curate” very lightly here, as the robotic overlords who feed on algorithms are the ones who gather up news and sharing from a Twitter list of National Writing Project folks (670 peeps, listed as of this morning … wait .. make that 669 … see below), and somehow, it comes together in what I think is a moderately interesting daily collection of media, tidbits and more. But I received a direct message on Twitter from a person in my NWP network about their inclusion into the “newspaper” this week and the notice of their Twitter handle in an auto-tweet that comes out every day. They clearly were not happy with it, and they wondered how their Twitter account got so entwined with mine. They suggested that it was a misrepresentation of both of our Twitter accounts. I think they thought I have been intentionally scraping their content and representing it as my own. Have I, inadvertently, doing that? Not in my mind. I messaged back to them, politely, and then removed from them from my NWP List, so as to avoid putting them in the same situation in the future. The last thing I want to do is make anyone uncomfortable when the robots take over. To be honest, I’m not sure bringing other NWP folks to their Twitter account or bringing a small spotlight to something interesting that they shared out or wrote about is such a bad thing, but that’s not for me to decide. I realize now that it is a bit of a can of worms, indicative of the Information Age. On one hand, I hate the lack of agency I have in actually curating the darn Paper.li thing. I don’t think I can manually add content, just people’s streams of information (or at least, I can’t do that with the free version I use. I’m not sure about the paid version.) On the other hand, I am grateful that the algorithms do all that work on my behalf, so that I don’t have to spend the time each day. Because, you know, it wouldn’t get done, otherwise. I’m a realist. It’s the typical Digital Age Cunundrum, right? How much agency do I give up to technology in order to achieve what I hope to achieve with the smallest amount of effort? And if I give up too much, am I really achieving what I wanted to achieve? What I hadn’t realized, until this morning, is that not everyone would be so open about it and grateful to be part of my NWP experience. I guess that part of curation — the view of the skeptical curatee (is that a word? The one who is being curated?) — never crossed my mind until this morning. Maybe it should have. I remember the first book I encountered about a writer writing about writing. It was Bird by Bird by Anne Lamott, and then I read Writing Down the Bones by Natalie Goldberg, which led me to Pilgrim at Tinker’s Creek by Annie Dillard, and then onward into the world of authors unveiling the art of writing. (Stephen King’s On Writing is a more recent one in the mix.) It was a magical experience for me to find those kinds of books as a young writer, and I continue to devour these “let’s pull back the covers and show the inside” stories even today. I am most intrigued about the relationship between writer and reader, and the narrative gaps between them. And I am conscious of this, as best as I can, when I am using technology and digital media to create a piece of writing. The role of the reader, I think, is changing, becoming more assertive, more part of the “story of the story.” Mulling over how an image replaces text, or how a video disrupts the narrative flow, or the well-place/misplaced hyperlink, or the use of an audio to add a layer of sound … these are all part of our emerging world of writers in the digital spaces, right? The question of how far does the writer go and how much space does the reader need/want is one of those running rails that always seems to hover over my keyboard when I am trying to create something that I hope will find an audience. When I am working on short-form writing, in particular, I am keenly aware of the reader and work to find a balance between the gaps. 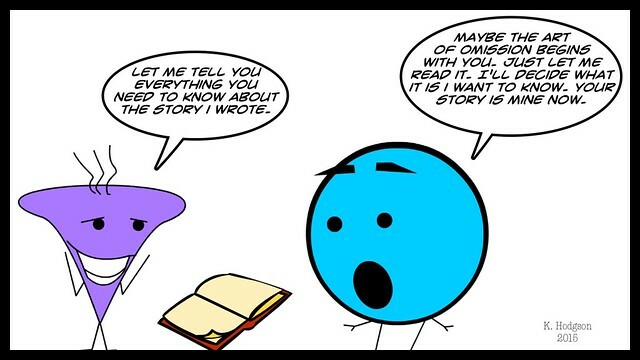 Of course, there is a lot of unknowns in the writer’s perceptions, too. This week, I came across an insightful piece about writing in The New Yorker by writer John McPhee, who shares stories about his life as a staff writer and teacher of non-fiction writing but he also helpfully narrows his piece to the art of “omission.” What to leave out. The dictate of the Green # (see article for reference). Not just for publishing reasons (we need more space so get cutting) but also, for the sake of the reader engagement and involvement. Parse your story down and let the reader build it up. McPhee cites Hemingway, of course, and others, and he says that consideration of the reader does a writer well. Taking his advice, then, I bid you leave.